In the absence of randomized controlled data, this Web-based inventory provides guidance on antibiotic prophylaxis decisions using readily accessible patient risk factors that, independent of dental procedures alone, have been suggested to increase the risk of PJIs (Table).2-5 The online AUC tool accounts for 64 clinical scenarios and in most cases (61%) advises against the use of antibiotic prophylaxis (eg, “Prophylaxis is rarely appropriate”). In the remaining scenarios, prophylaxis is deemed reasonable (eg, “May be appropriate”) in 27% of cases or recommended (eg, “Appropriate”) in 12% of cases based on risk factors, such as underlying severe immunosuppression or history of PJI. The AAOS/ADA inventory is available on the AAOS website2 and may be a valuable tool to target antibiotic prophylaxis, reduce the burden of unnecessary antibiotic exposure, and possibly reduce the risk of, or a concern for, associated infections. Berry DJ, Bozic KJ, Mino DE, et al. American Joint Replacement Registry 2016 Annual Report. American Joint Replacement Registry website. ajrr.net/publications-data/annual-reports. Accessed November 17, 2017. American Academy of Orthopaedic Surgeons. Appropriate use criteria: management of patients with orthopaedic implants undergoing dental procedures. AAOS website. orthoguidelines.org/go/auc/default.cfm?auc_id=224995&actionxm=Terms. Accessed November 17, 2017. Sollecito TP, Abt E, Lockhart PB, et al. Evidence-based clinical practice guideline for dental practitioners—a report of the American Dental Association Council on Scientific Affairs. J Am Dent Assoc. 2015;146(1):11-16.e8. doi: 10.1016/j.adaj.2014.11.012. Quinn RH, Murray JN, Pezold R, Sevarino KS. Management of patients with orthopaedic implants undergoing dental procedures. J Am Acad Orthop Surg 2017;25(7):e138-e141. doi: 10.5435/JAAOS-D-17-00006. Berbari EF, Osmon DR, Carr A, et al. 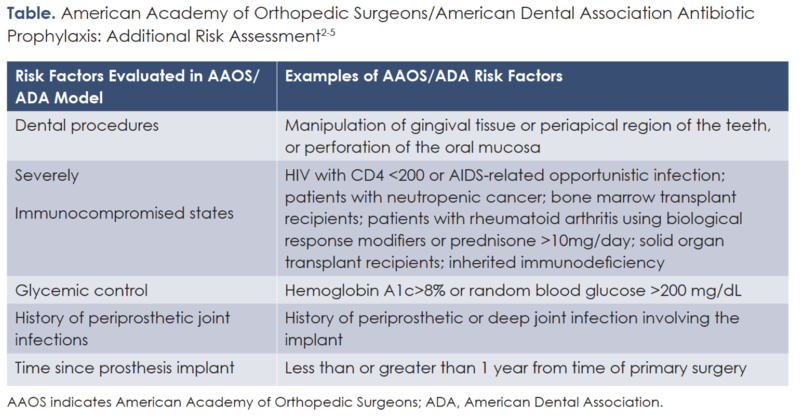 Dental procedures as risk factors for prosthetic hip or knee infection: a hospital-based prospective case control study. Clin Infect Dis 2010;50(1):8-16. doi: 10.1086/648676.